This scientific publication presents the outcomes of the sixth edition of the EWWUD – European Workshop in Waterfront and Urban Design, an event organized by DAU at ULHT campus on February 2016. EWWUD workshops gather professors and students from all over the world for the study and proposals for waterfront-specific issues. The 2016 edition focused on the pressing issue of migrations, and the participants proposed ideas in architecture and urban planning for several sites along the waterfront between Lisbon and Cascais (a special focus was made on the sites located within this last municipality, a partner for the workshop and a sponsor of the outcomes publication). These sites are known to all, and the ideas for their intervention are surprising. The Waterfront Migrations – Cascais book presentation will be made by Professor Pedro Ressano Garcia, Head of DAU, and by Professor Spela Hudnik of Faculty of Architecture of the University of Ljubljana, and is a feature of the Summer School ULHT Lisbon 2017 Opening Session, taking place that same day at MAAT. 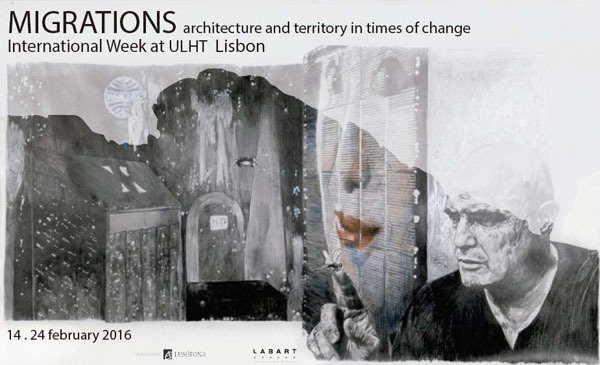 Summer School ULHT Lisbon 2017 is the seventh and present EWWUD edition, with the theme Architecture and Climate Changes – Strategies in waterfront urban áreas and will take place from the 17th to the 30th June, gathering partipants from seven european countries in the study of sites on the waterfronts of Almada and Oeiras.